And, Education (College) Planning for clients who require it. So, if you have specific objectives and wish to put a cohesive plan in place this may be the service for you. As a fee-only firm we offer the service, typically at a flat fee and have no products to sell. The fee our clients pay is our only source of compensation – and this ensures we offer objective and fiduciary (best-interest) advice. There is no conflict of interest in the way we practice. The flat fee covers financial planning and investment management. We certainly assist with implementation of the plan and the recommended portfolio of investments – but are never paid additionally for doing so. When developing a financial plan we ask for a minimum commitment of one year – with numerous meetings during the year. We ask for a year because it takes time to gather and confirm financial information, analyze the situation, present the strategies and plan and also implement. We have found that our clients generally prefer longer term relationships and planning. Nearly all continue planning after the initial year – because objectives change and situations change almost constantly. Most prefer to retain us to review, monitor, manage and adjust the plan over time. We too prefer building long-term relationships. 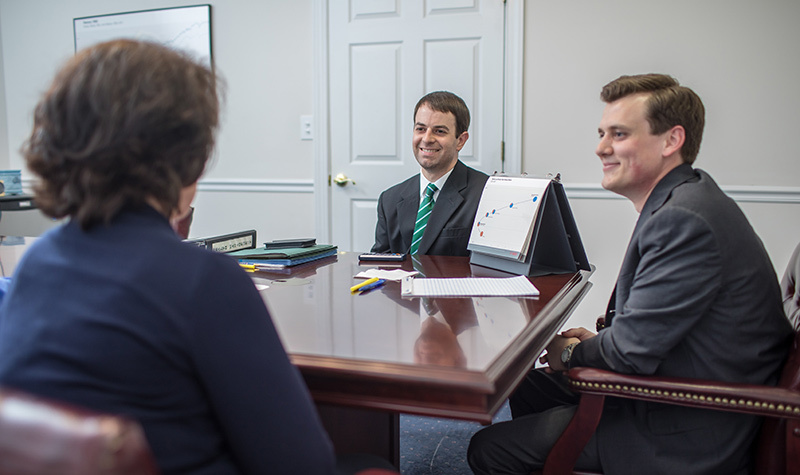 The firm has clients who date back to its early years in business – and has worked with many clients for 10+ years. If it sounds like we may be a fit, please call or use our Contact Form – and let’s start a conversation. An initial meeting is offered at no charge for those who have a serious interest. This is normally in-person, but can be by phone – and our fee is quoted at that time.